Every hero wishes they had a sidekick that's as cool as Batman’s. There's just no other sidekick out that has the heart and dedication that Robin has. Oh, and not to mention that hardly any other hero out there can match his awesome unique style. He truly is a boy of wonder and now you can be too with this awesome Adult Robin Muscle Costume! Don’t worry about banging out a bunch of crunches and push-ups. Robin may be in peak physical condition but he was also a master acrobat in the circus before joining Batman in his fight for the city of Gotham. You won’t need to worry about getting fighting fit if you’re not already, this costume will make you look as jacked as a bodybuilder! The Riddler and the Penguin will be running for the hills. Even the Joker will think twice about going through with his dastardly plan when you show up to the scene with Batman and this amazing muscle-bound outfit. Have fun shouting out goofy phrases like, “Holy Hamburger, Batman” or “Holy Dance Floor” every time you enter the party scene! This muscle jumpsuit comes with an awesome cape to blow in the wind behind you while you overlook the city from the highest skyscrapers, an awesome black eye mask to conceal your identity and protect your loved ones while you clean up the streets of your neighborhoods. 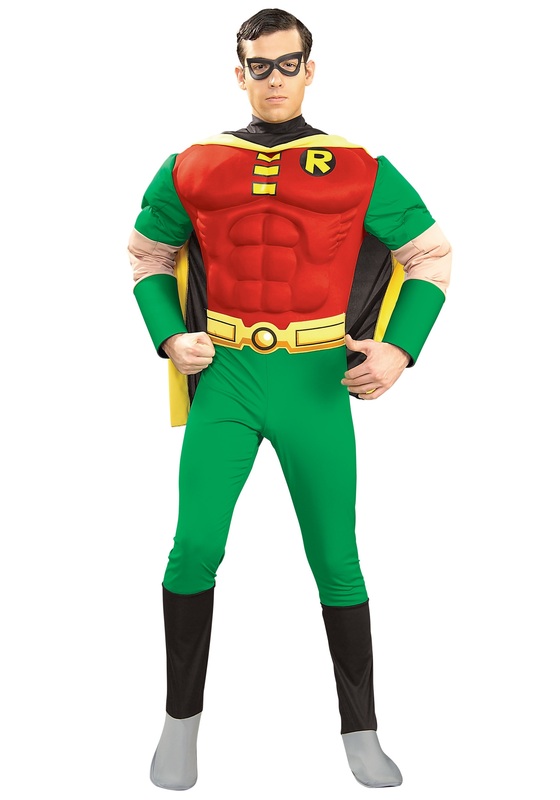 With this Robin Costume kit, you’ll be more than ready to take on the role of Boy Wonder and enjoy an amazingly heroic Halloween!